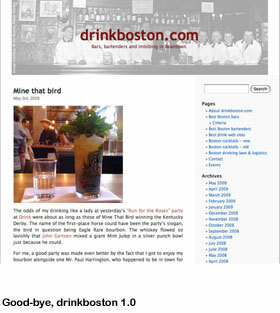 Welcome to drinkboston.com’s shiny, new package. A simple, default WordPress template served the site well for three years. But it was time for a more expansive design with cooler fonts and added features, like a randomly generated cocktail recipe and space for promoting events. I gave web designer Noah Kuhn a stack of old magazines from the ’40s through the ’70s for inspiration. I’m happy with the result. Your thoughts? Looks beautiful! Lots of useful stuff now available right from the front page, nice. Hey Lauren- Very easy on the eyes. Nice, tight upgrade. 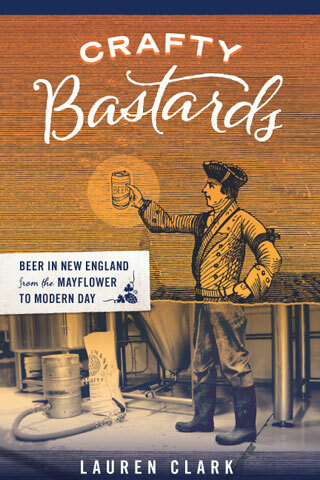 Diggin’ the redesign, and I think the random recipe is a great idea. Thanks for the feedback, y’all. Clean, rad. I am psyched about the presence of the “Events” space. Holy hell! I love the upgrade! Keep up the great work! Looks great, but … Where’s the forum?? N-I-C-E…great job. Easy on eyes, easy to nav. Good job! Awesome, Lauren! It looks terrific. Nice work Lauren (and Noah)! I’m, very slowly, working through a site upgrade so I appreciate how much work the redesign was. Congrats! I enjoy the site redesign, but one quick question. When I am in a post, such as this one, how do I get to the main page? (I got to this page from off site, so the back button would not solve the problem.) Normally the logo links back to the main page, but that does not seem to be the case. The random recipe section is a great idea. Dave, that’s strange. For me, the logo/masthead *does* link to the main page. Can you try again and let me know if the problem persists? Well that was weird. Now it does work. I went to a few different pages on the site and none seemed to work at the time. Maybe it was my lack of coffee. LOVE it! Very professional work. Looks beautiful! Easy to read, with just a hint of 70’s shag carpet. Heat POM and sugar in a saucepan until boiling. Turn heat down and let mixture simmer gently for 5-15 minutes. Let mixture cool, pour into a sealed container. Add a drop or two (literally — the stuff is strong) of orange flower water and store in fridge. To preserve the grenadine for more than a week, add a little high-proof vodka. You can also freeze the grenadine. Alternate recipe: Combine 2 parts POM and 1 part sugar in a sealed container and shake until sugar is dissolved. Store in fridge.